Hey guess what? If you've got SLI and two monitors, you no longer have to turn SLI off to use both monitors. It's been 4.5 years since the introduction of SLI and we finally have support for a feature that should've been there from the start. Granted AMD/ATI/SnowWhite didn't have support for this multi-GPU/multi-monitor setup until last year with the Radeon HD 3870 X2 so it's not purely a NVIDIA thing. If you run a full screen 3D application your second display will go blank and come back as soon as you've quit your application, whereas in the past you had to go into the NVIDIA Control Panel, enable SLI, run your 3D app/game, go back in, disable SLI and then you'd get your second display back. In the new driver you don't have to do any of this - sweet. While NVIDIA's driver supports up to 6 monitors, for SLI to work you can only have displays connected to the master card in SLI with a maximum of two monitors connected. So if you want to have more than 2 monitors and support SLI you'll either need three cards or you will still need to disable SLI to get your non-master SLI card to output video. The multi-monitor driver interface also got an update in a very sensible way; you can now select which monitor will receive the display when running in SLI mode, it's no longer tied to a fixed output on your video card. Hooray for flexibility! 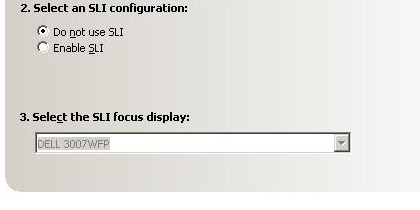 While selecting the SLI Focus Display is done in the SLI settings menu, when adjusting your multi-monitor setup, there is an indicator that lets you know which display is the SLI focus display. It's a little green square in the corner. Check it out. When we played around with it, the primary display had to be the SLI Focus Display when the primary display was connected to the SLI bits. The only way to make the primary display (the one with the start menu and all that stuff) not the SLI Focus Display was to run it off a second card. 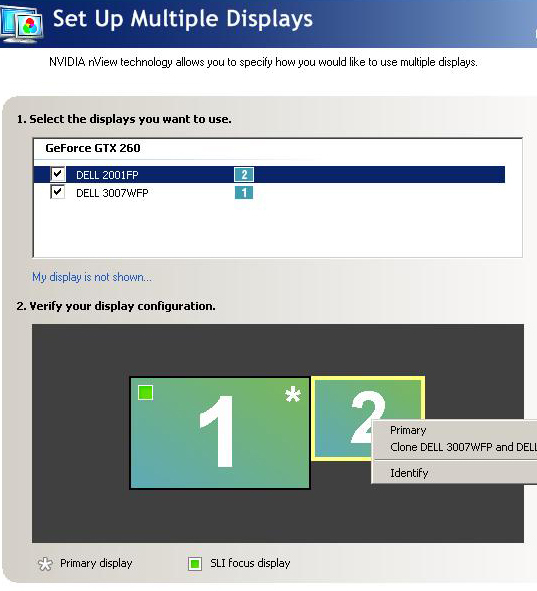 At which point, the SLI Focus Display could still be selected if two monitors are connected to the SLI hardware. Another multi-monitor feature to note is that 3 games (Flight Simulator X, World in Conflict and Supreme Commander) are also accelerated across multiple monitors. We would really like to see all games supported across multiple monitors (without the use of one of Matrox's DualHead2Go or TripleHead2Go boxes), but there are still some difficulties with rendering a game across multiple displays when the game does not expect to have its framebuffer split. It is good to see that NVIDIA is at least extending support of new features in new drivers to games whose developers have specifically included multiple monitor support. The extensiveness of the SLI and mulit-monitor flexibility is nice, and we are definitely glad to finally have all of this working. It's been a long time in coming, but we are glad that it's finally here. As others have stated there is quite alot of bias in Sandman74's post. One can easily point out that NV has had more vista related drivers issues then Ati. I however i'm not gonna touch that doesn't matter to me where you loyalty is. "What this shows is that they changed their minds after the 4870 was released and decided that their never should have been a 192 core version to begin with." Well, as a Nvidia owner, I'm hoping these drivers resolve the nv4disp system crashes that the last couple of drivers have caused. At least, my prior ATI CCC crashed occurred while gaming while my current Nvidia crashes occur while just browsing a website.